We are delighted to share the news that our quilt 'A Bomber's Moon', is currently on exhibition at Lyme Park, Cheshire as part of their Winter Exhibition, Lymescapes. The exhibition runs at the weekends, Sat 7th Nov - Sun 14th Feb 2016 also Monday 28th Dec and Fri 1st Jan. 11am- last entry 3pm. Free to National Trust members or £4 per adult. arthur+martha artist Lois Blackburn, will be an artist in residence at Lyme Park Sunday 6th December. people who have dementia and we couldn't fail to notice the beneficial effect that group stitching had, joining people together in a shared act of making that had short-term rewards (touch, colour, companionship, creativity) and an ambitious goal. 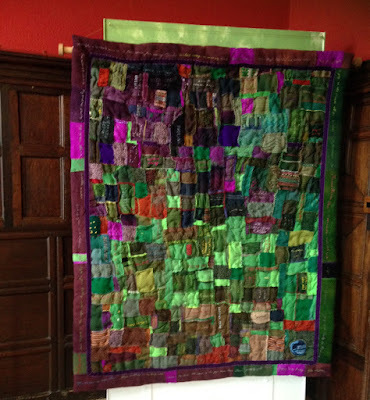 This quilt project was recently given a Foundation Derbyshire Award for its mixture of inclusivity and creative ambition. Stitching the Wars is resulting in a lasting legacy for everyone involved, a unique way of sharing and passing on older peoples histories. The quilts and poems act as celebration of lives lived, an act of community remembrance. a full moon for seeing. boiling water when my son had the croup. Funding, support and partners: The Arts Council England, Derbyshire Community Foundation, Derbyshire Dales Council, Derbyshire County Council, Farming Life Centre, Age UK, The Alzheimer’s Society, New Mills Volunteer Centre and The Quilters Guild of Great Britain.